Our biggest and possibly hardest New Year’s resolution was giving up our beloved coffee in the mornings. I was afraid that the absence of my liquid energy would leave me drained and grumpy (and it did for a few days) but now I’m hooked on something else entirely. David is really into the benefits of juicing right now and my absolute favorite morning pick-me-up is his Carrot/Orange Juice (I beg him to make it every morning, but he insists that we be a bit more balanced). It is loaded with vitamins A and C and it has a great deal of potassium. I’ve also noticed that I’ve developed a slight rosy (possibly orange-ish) glow in my usual pale winter pallor. That doesn’t sound as appealing as it looks. I actually look slightly flushed all of the time now (in a good way, I promise). David doesn’t like to use bottled or concentrated juices so he gets up early makes fresh juice every morning. He insists that “fresh is best.” He is also big into using the best possible ingredients available, which is why we love our local farmer’s market so much. I’ve been trying to convince him to juice kale, but so far he has been fixed against it. He is still haunted by my green smoothies from last year (yes, they were that bad). 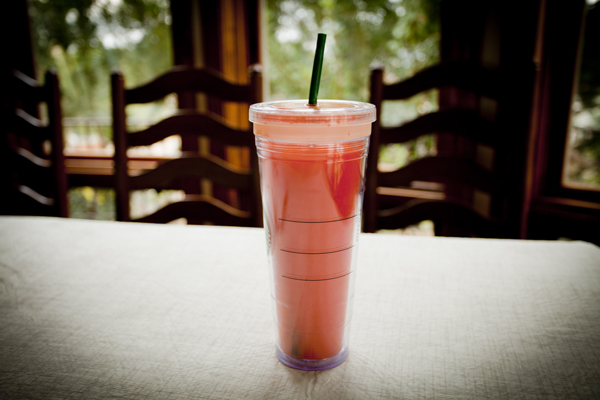 Combine freshly squeezed carrot juice and freshly squeezed orange juice in a large pitcher and stir to combine. It usually takes me several hours to drink a large serving and I often end up adding more ice as the time passes to keep it super cold. David likes it without the ice, but he’s European.